HIS Dance Ensemble Presents "ARK"
HIS Dance Ensemble Creates remARKable Story! March 8 & 9, 2019 at DeVos Center for Arts and Worship. 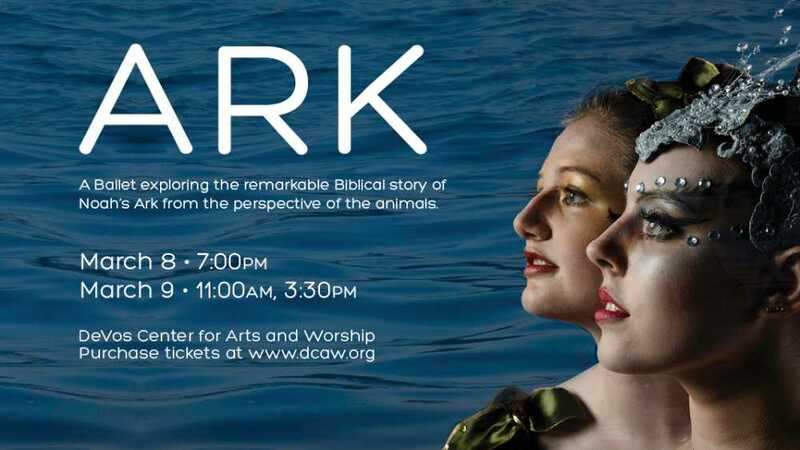 ARK, is an original contemporary ballet exploring the remarkable Biblical story of Noah’s Ark from the perspective of the animals. Experience a fresh outlook into a familiar story as the animals are separated from their families, gathered in a strange place and told to board an unknown vessel. A great storm eradicates their world, destroying everything familiar and loved but God reveals Himself in an amazing way. “The water reminds us that through Christ we are made new and reflects the love God has for each of us,” describes Co-Director Mary Jo Priest. Expert lighting, set design and creative costumes transform this beloved Bible story into a spectacular theatrical event!